youth usage | If you think legalizing marijuana won't affect you... Think Again. “So called medical marijuana in other states has become a farce and a sham. The average user of smoked medical marijuana has no chronic illness and is a white male in his mid-30s with a history of drug and alcohol abuse. . . In the last 20 years and due to market demand, constant genetic engineering has increased THC potency in marijuana plants, and extraction-concentration methods are becoming extremely popular and widespread. become addicted.”Marijuana is the 2nd leading cause of impaired driving arrests. One in six adolescents trying marijuana will become addicted. “In the city of Denver since the legalization of marijuana Denver Police Department is dealing with a 900% increase in the unlawful cultivation and manufacture of marijuana concentrate, and a 99% increase in unlawful distribution of marijuana and marijuana concentrate. Marijuana is the #1 problem in Colorado schools. In school year 2015-16, 63% of all drug related school suspensions were for marijuana. 58% of all drug related school expulsions were for marijuana. 73% of all drug related school referrals to law enforcement were for marijuana violations. Youth past month marijuana use is 74% higher than the national average. If the changes observed in Washington are attributable to legalization, why were there no changes found in Colorado? The authors suggest that this may have been because Colorado’s medical marijuana laws were much more liberal before legalization than those in Washington. After 2009, Colorado permitted medical marijuana to be supplied through for-profit dispensaries and allowed advertising of medical marijuana products. 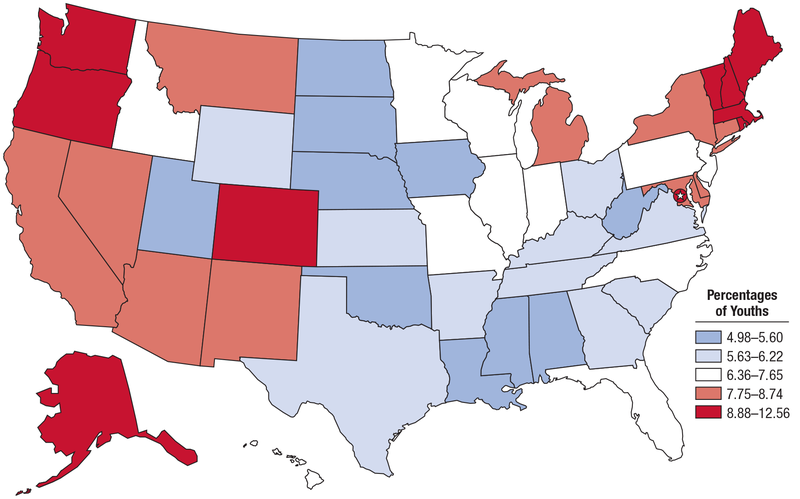 This hypothesis is supported by other evidence that the perceived risks of marijuana use decreased and marijuana use increased among young people in Colorado after these changes in 2009. This year, daily marijuana use exceeded cigarette use among 10th (2.5 vs. 1.9 percent) as well as 12th (6.0 vs. 4.8 percent) graders. The top 10 states with the highest adolescent marijuana use rates in 2013-2014 were all states that legalized pot as medicine or as recreation. The lowest adolescent use rates were reported in states where marijuana has not been legalized as medicine or as recreation. How can pro-pots argue that legalization will reduce youth marijuana use? Stats prove otherwise! The earlier an individual begins to use marijuana, the likelier he or she is to be arrested. What greatly concerned the researchers is that many teens don’t even consider marijuana use a distraction to their driving. According to National Families in Action, four individuals—George Soros, Peter Lewis, George Zimmer, and John Sperling— contributed $1,510,000 to the effort to pass a “medical” marijuana law in California in 1996, a sum representing nearly 60 percent of the total contributions.